Every backyard zip line should have a launch platform, ladder, or a tree house at the start of the ride. The height of the launch point will vary from about 4 feet for a 100' zip line to 20' for a 250' zip line. The zip line with either land in a distant treehouse, or it will stop by gravity and coast back to the middle of the cable which is ideally only a few feet above the ground. 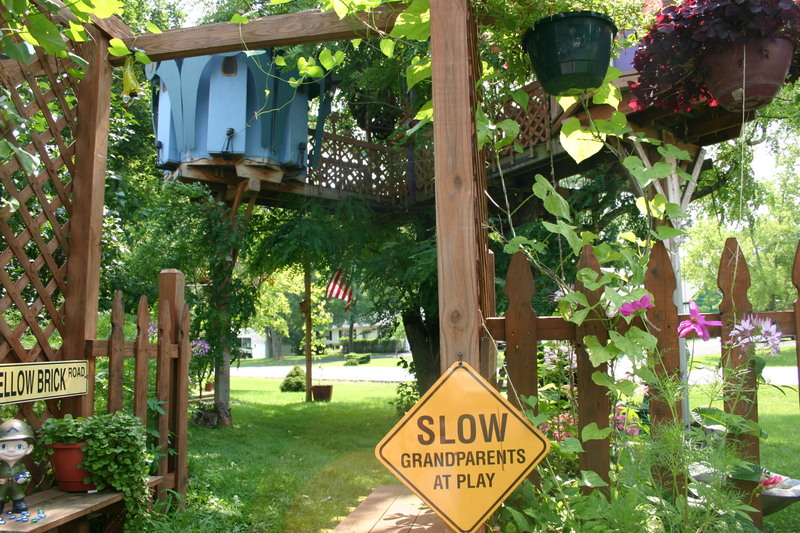 In multi-tree tree houses, the best design is to arrange a porch space facing the zip line launching direction. Ideally, one of the trees in the treehouse comes up in between the wall and the porch space, so that you will have access to connect the zip line cable without interference with the structure. This setup is also equally easy to achieve if you are building a post supported treehouse - just put four posts behind the tree, and wrap a cantalevered porch around the tree for the launch pad. Zip line cables sag the fastest at the begining of the ride. If the treehouse launch area sticks out too far from the tree, you will either have a hard time getting hooked up to the zip line or you will bottom out on the edge of the platform. 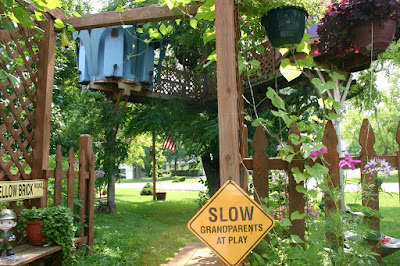 For this reason, it seems to work best if the platform is only 3-4 feet out from the tree for small zip lines under 200'. 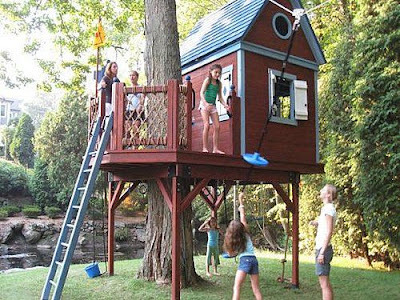 For zip lines over 400', or those with 1/2" cable or bigger, you may be able to use a treehouse platform that sticks out much further from the tree. A canopy tour is simply a bunch of zip lines between tree houses. However, building such a labyrinth of zip lines and making the elevations of the tree houses work out can take experience or a lot of trial and error. If you're relying on your gut feeling and trial & error, you should start with the zip lines, make them all work at acceptable speeds, and then build the tree houses under them! When testing the zip lines, attach them using tree slings or some other method that doesn't damage trees, because you may have to adjust the heights of each cable before you are ready for the permanent tree attachment. 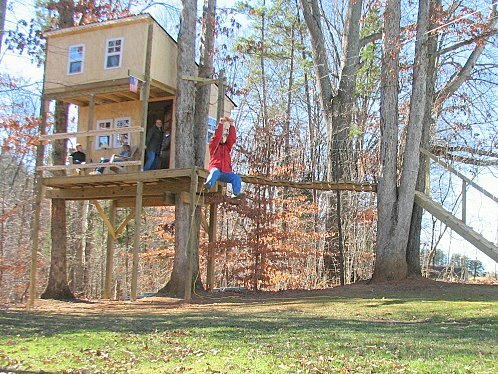 Once that is settled, the tree houses can be built 8-12' lower than the cable attachments, depending on the length of the ride, amount of sag, and size of cable. If you would prefer to hire a company with experience, then make sure they have experience with both tree houses and zip lines. 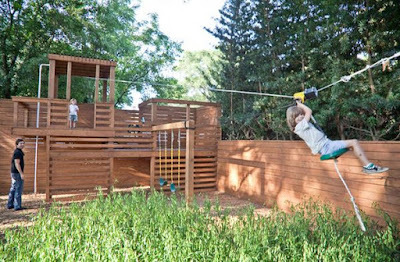 One Great trick is to put a ladder, stair, or ramp facing right down the zip line path. This way, taller riders can take a step or two down before their weight is on the cable, but kids can just jump off the treehouse platform. This arrangement makes it easier to connect short or light people to the zip line cable from a standing position on the treehouse.